Classroom activity tables have never had so much variety. With the multitude of teaching styles and teaching environments, there is much need for diversity in the school activity table market. Varying sizes, shapes, materials, finishes and more make up the hundreds, if not thousands, of available activity tables. Online and catalog wholesale furniture dealer, Worthington Direct, has many activity tables to choose from for school, church and early childhood centers. The most common activity table is a rectangular shaped, laminate top, adjustable height table that are often a favorite of teachers and educators. But what about those very specific tables; what are they used for? A new growing trend is the anti-microbial table options that come about in an attempt to keep flu and germs from spreading among school students. 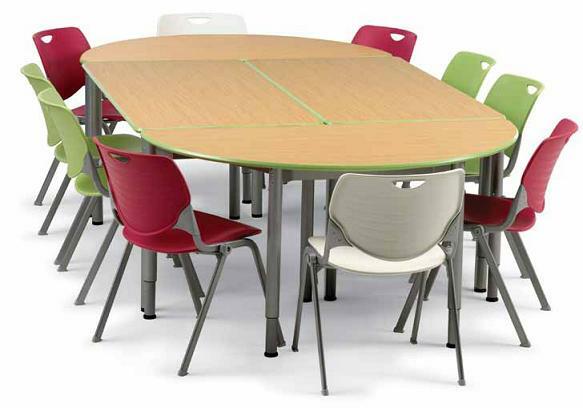 These tables feature germ destroying technologies that help keep classrooms free from harboring germs. Many schools use these tables, as well as churches, universities and those setting up displays in public settings. 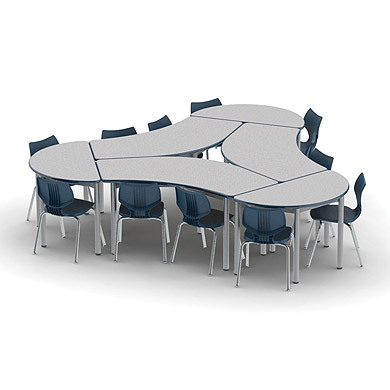 Another unique activity table is the collaborative shaped tables that allow students a creative shaped table that allow them to work together and have their own independent space. These activity tables are especially popular in the younger school grades for group work, discussion and art projects. Look for activity tables that suit you specific needs. For instance if you have a lot of wood trim in your space, consider a solid wood table. If you need additional storage in your classroom, try a table with storage bins located just under the table top. Always measure your room and allow at least 3 feet of space for easy entry around the table.